Measuring your performance is a crucial step that nonprofits must take to succeed. There’s no better way of isolating and troubleshooting any ongoing problems. And worry not, there’s no shortage of methods of measuring performance. They’re called fundraising success metrics here, but they are also often referred to as key performance indicators (KPIs). These metrics are the analytical tools nonprofits need to continue raising more and more funds. If you’re looking for the top metrics that your nonprofit should be tracking, this list of 15 has been split into four separate categories. Skip around and see what stands out as a must-have KPI for your nonprofit. DonorSearch’s Online Tools – Our suite of online tools is ideal for any nonprofit who is interested in learning more about their donor’s previous charitable giving, real estate holdings, and political giving. Fundraising Report Card – A free tool for nonprofit executives who want better insight into their organization’s analytics including donor growth, donor acquisition, and donor retention. 360MatchPro – A perfect platform for medium to large nonprofits who want to understand how much they could raise from corporate giving programs and identify their largest matching gift opportunities. These are the big KPIs. They’re the ones most organizations are tracking. 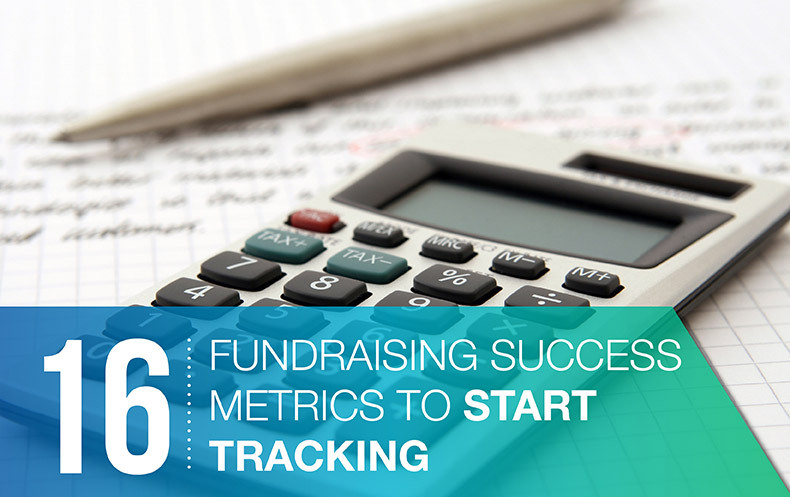 They give you a picture of your fundraising success and can point you in the direction you need to go. Remember — you won’t get far with any of these metrics if you have inaccurate or incomplete information on your donors. 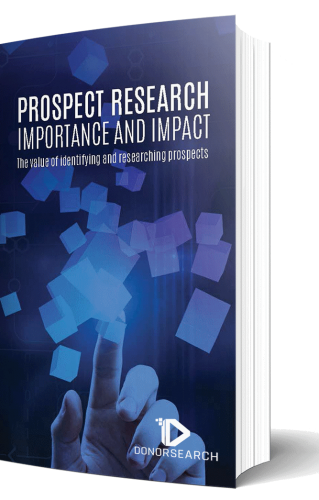 Perform prospect research to complete your donor data files. Cost per dollar raised is one of the most commonly referenced fundraising success metrics. CPDR answers a very simple question. Did we raise money, lose money, or break even? The definition and means of calculation are explicitly stated in the metric’s name, but let’s walk through the process to provide any necessary clarification. To determine cost per dollar raised, divide expense by revenue for the given fundraiser you’re examining (event, direct mail appeal, etc.). If the expense and revenue are equal, you broke even and don’t need to carry out any calculations. If expense is higher than revenue, you lost money. Your calculation will yield a number more than one. The opposite will be true if you raised money. In this instance, for every dollar you raised, it cost your nonprofit $0.25. Fundraising return on investment is equally as popular a metric as cost per dollar raised is, and it’s very similar. Instead of dividing expenses by revenue, you divide revenue by expenses. Once you’ve divided the two amounts, a number greater than one indicates that you’ve raised money. Most organizations tend to favor one of these first two metrics over the other, like ROI over CPDR, for example. They both provide near identical information. The differences are almost negligible. Your organization’s preference will probably boil down to the means by which you’re looking to improve. If cost cutting is a priority, nonprofits would likely be more interested in cost per dollar raised; whereas, return on investment is a great indicator of the effects of making strategic changes to increase revenue. Does your organization track how many donors it retains on a year-over-year basis? It needs to be. Let’s face it: the time it takes to cultivate donors is a time-intensive process, and after all the work engaging your supporters you don’t want to have to do the process all over again with a whole new set of supporters. Of course, you can always continue to grow their donor pool through acquisition, but you don’t want to waste all your efforts. Maintaining donors through retention is just as essential as acquiring new donors. The two sides of the fundraising coin work best in conjunction. Your acquisition and retention rates should be improving concurrently. However, more often than not, nonprofits place much stronger emphasis on acquisition than retention. Acquisition of new donors is an expensive endeavor, though. Retention is more cost effective. How your nonprofit should prioritize communication with supporters. If your organization is acknowledging donors in a thoughtful and immediate fashion. The ease in which donors are able to give via your various donation methods. Track your retention rate to see how your organization is doing and discover if your retention practices need improvement. If you do have an undesirable rate, look to your stewardship practices first, and make sure you re-evaluate with an eye for retention. What is your acknowledgment process? When do you follow up? How do you continue communications? Check out Razoo’s blog for 10 ways to improve donor retention rates, including ways to respond to the data you receive. Donor growth is what one might consider a domino metric. If donor growth is down, it’s likely that it didn’t get that way on its own. Lack of donor growth, or worse donor loss, is often the result of multiple factors. Measuring your donor growth ensures that you’re paying attention to your overall performance and puts your nonprofit in a situation to address any concerns early and quickly. Use this metric in conjunction with some of the others on this list to determine exactly why your number of donors isn’t growing. Essentially, you’ll be back-solving. In order to determine conversion rate, you need a goal action and a list of donors you’d like to complete that action. The goal action could be anything from attending an event to responding to a direct mail letter, but the most common goal action involves donations. Typically the rate will be investigating how many prospects donated to a specific campaign or took an action as a result of a specific request. To find the rate itself, divide the number of people who completed the goal action by the total number of people who were given the opportunity to do so. Then multiply the number by 100 to get a percent. Let’s take a simple example. Say you sent out an email to 100 donors, asking them to follow a link and make a donation online. Of those 100, 30 followed the link and took the requested step. Therefore, your conversion rate in this instance was 30%. Conversion rate is one of the most cut and dry methods of evaluating the success of a given request for action. This indicator is as standard as it sounds. How many gifts did your organization secure through the month? The quarter? The year? Tracking gifts secured over time is another way of saying you’re tracking donation growth. You’ll see crossover among some of the categories, but the more in-depth you go, the better you’ll be able to adjust and plan for the future. Tracking the percentage of contributions matched through corporate philanthropy or employee matching gift programs is an easy to identify areas for growth. According to Double the Donation, an estimated $4-7 billion in corporate donations goes unclaimed every year. The best way to get started claiming some of that support and boosting your own revenue is to establish a baseline for growth. Determine how many of your donors already take advantage of matching gift programs, and then start promoting them to the rest of your donor base. Keeping track of percentage of corporate philanthropy funds within your total donation intake is also a smart way to identify segments of donors that could be solicited for increased support. 1 in 3 donors indicate they’d give a larger gift if matching is applied to their donation. The top nonprofits use giving levels to their advantage. They let giving levels help inform their acquisition and retention strategies, while actively seeking upgrade opportunities. These three KPIs are included with that in mind. To calculate average gift size, divide your revenue for a certain fundraiser or time period by the amount of gifts you received in that same window. Average gift size is a metric best used when tracked on a recurring basis. That way, you can see if your gift size is growing, stagnating, or decreasing. At the same event year-over-year to see your progress. At all of your events for the year (or, multiple years) and figure out which events draw the largest donations. Over a repeated, fixed time frame (like six months or a year) and track general changes. Average gift size can be a big help in evaluating the success of your major gift efforts. After all, more major gifts means a higher average gift size. For more tips on improving major gift efforts at your nonprofit, click here. It is just like average gift size, but exclusively for major gifts. You need to know your current major gift status if you want to improve it. The two really go hand-in-hand. That’s why they are placed next to one another; however, average major gift size can stand on its own as a metric, so it needs its own spot on the list. We all know the expression, “Don’t leave money on the table.” In fundraising, “leaving money on the table” is securing one size gift when you could have asked for and received a larger one. Learn more about determining donor giving capacity here. Once you know your donors’ giving capacities, this metric comes into play. Testing the average giving capacity of your donors to determine how best to bracket out your giving levels. Taking the average giving capacity of a certain donor level (mostly major gifts) to assess the current status of your efforts in that area. Compare giving capacity averages to gift size averages and see how you’re doing. If you leave nothing on the table, those numbers should match up pretty closely. Donations start with engaged prospects. See how you’re doing with donor engagement with the following metrics. As long as your nonprofit keeps records of donor-staff interactions in its database, you’ll have no issue deriving the frequency of donor contact. One common concern among fundraising entities surrounds how much is too much (or too little) contact. You have to build relationships with your donors, but determining that sweet spot is no small feat. A good place to start is by looking at what you’ve done thus far, i.e. how often you contact donors. When you have those numbers, look at your conversion rates. Does reaching out to one kind of donor more than another yield a better conversion rate? What about the ROI? The CPDR? You might have a stellar conversion rate from infrequent in-person meetings and a much lower rate for frequent emails, but those statistics aren’t comparable in a useful way. Remember the scientific method and test one variable while keeping all else constant. As you develop your system of tracking, you’ll find the most productive combination all these metrics for your nonprofit’s prosperity. Data like this and how you use it can be crucial to keep your donors engaged, find the right campaigns for them to donate to, and stay up with what donors want from your nonprofit. Check out Razoo’s blog on their data connect features for more. As peer-to-peer fundraising and various iterations of “a-thons” grow in popularity, fundraising participation rate is more important to track than ever before. With this performance indicator, nonprofits track just how many of their event participants raise funds. For example, a participant in your road race who paid an entry fee is not a fundraiser. However, if that same participant gathered pledges in addition to the entry fee, (s)he is then a fundraiser. Event attendees who donate and double as fundraisers are unquestionably assets. Examining this rate can tell you if your organization is missing out on the opportunity. If so, engage these participants through clear and direct communications. Think of this as the older sibling of gifts secured. Asks made is the precursor. Asks made is as straightforward as seems. How many asks are your gift officers making? It’s a number you’ll need for other calculations as well, but it can stand on its own. At risk of stating the obvious, if you want the donations, you have to make the asks. The internet is the new(ish) frontier of fundraising. Your online presence and tactics deserve assessment as much as any of your activities. Test out the three below to start. As more and more donations come in through online channels, it is critical that your nonprofit calculates your online gift percentage. Online giving is the way of the future, and if your organization wants to avoid getting left behind, it’s going to need to step up its online giving game. The whole online giving world is new compared to fundraising methods like special events and direct mail. Even though standards and best practices are solidifying, they’re not as concrete and ingrained as strategies for other methods. Study your own organization’s online strengths and weaknesses and develop specific practices for your situation and needs. We don’t need to rehash the conversion rate discussion from earlier on in the General Fundraising Metrics category. The purpose of including this here is just to highlight why this statistic is significant. Emails are free and easy to send out. Because of that, making an impact through email is tough. Most of your donors receive hundreds of messages in their inboxes in a week. Standing out in an inbox is challenging enough, and that’s without throwing in the fact that you might be shuffled into the spam folder. Tracking email conversion rate tells you how you’re doing so you can appropriately readjust. Specifically, you’ll want to keep an eye on click-through and open rates. Look for trends among the emails that have high rates in those regards. You might find that certain types of content or writing styles have more opens and click-throughs. You’ll also be able to identify the best day and time of day to send your emails. Tracking opt-out rate will help you avoid being labeled as a spammer. If too many people unsubscribe to your newsletter, you’ll start getting filtered out more and more. The best way to avoid a situation like that is to track, so you can identify the opt-outs early and reconsider your email approach before more people follow suit. That’s it! 16 success metrics. You made it through. Examining all of these on a regular basis would be excessive. Pick out what your organization currently needs and then add and remove indicators as you see fit. Don’t forget — if gaps in your data are holding you back, perform a prospect screening to fill out your donor profiles.